I don’t know about you, but the only V-day tradition I have involves consuming copious amounts of Chinese food. That routine has held steady for nearly fifteen years now (! 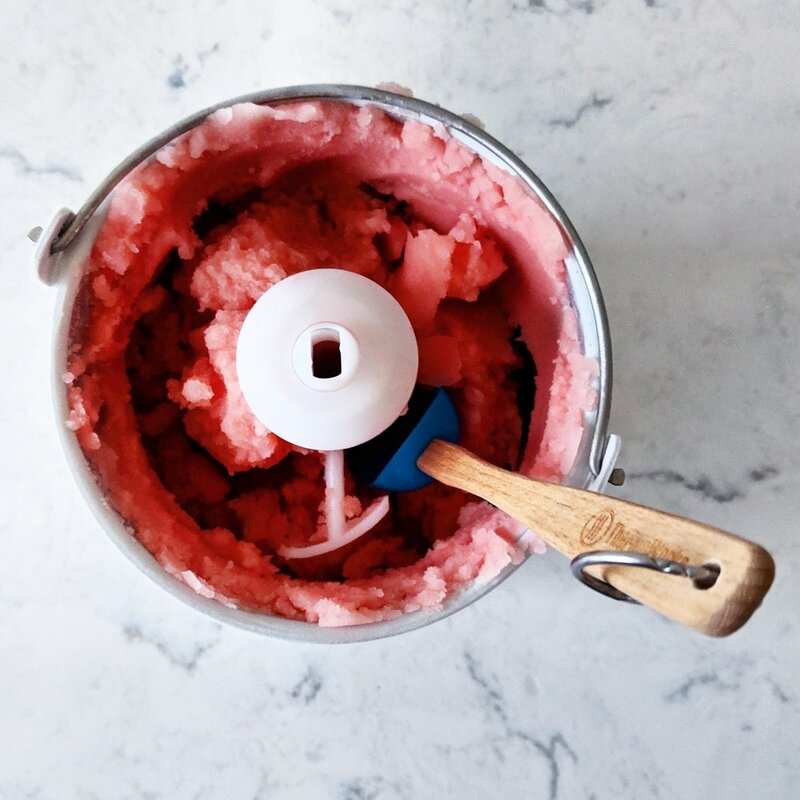 ), and while I will likely be too full to eat this sorbet after dinner, its perfectly pink color and delightfully balanced tartness would serve as a delicious — and easy — Valentine’s Day dessert. If you’re a regular Hayes in the Fog reader, you’ll notice that this recipe looks familiar: it’s a building block in my citrus sorbet fizzes, but because it also stands so well on its own, it more than deserves this standalone shout-out. Make the simple syrup by warming up water to a near-boil and then adding in your sugar until it dissolves, forming a syrup. Take off the heat and let cool before using. Stir together the simple syrup, citrus juice, vodka and salt until combined. Place a container (I use the middle size option of this Le Creuset one) in the freezer so you have a cold dismounting option for your finished sorbet. Pour your syrup and juice mixture into your ice cream machine and follow its instructions for spinning and freezing. The consistency of the sorbet was perfect to use right after it spun, but your experience may vary depending on your machine. If it’s not quite solid enough, keep it in the fridge until it’s reached your desired consistency. If making ahead, you’ll want to pull this out 10-15 minutes ahead of when you’ll want to serve it. Roast some pistachios to eat on top of it. Use more blood oranges if you want it slightly sweeter and/or even pinker in color.